It seems only natural to assume that the vocabulary of a particular language should grow to reflect the culture of the people (or peoples) among whom it developed, as well as the natural environment(s) within which it evolved . An example which has been popularly used to illustrate this point has been that the Inuit Peoples (once erroneously referred to as Eskimos), denizens of some of the worlds coldest regions, have numerous different words for snow(with claims of up to 100 different snow-words having been cited in the past by respectable sources). And though you might be surprised to learn that now scholars have DEBUNKED this example for various reasons (most importantly that there are SEVERAL Inuit languages, and if each one is looked at seperately there seem to be no more words for snow in them than there are in English), I think it is still safe to say that language often DOES reflect environment, history and culture ( just think- English, which developed in northern climes, has as many expressions for snow as any Inuit Language, certainly many more than do , for example , Thai or Malay). As I am completely unfamiliar with any of the Inuit-Aleut Languages, I cannot hope to add anything to the ESKIMO WORDS FOR SNOW debate. However, long experience with Japan, its culture and language, has made it clear to me that different cultural, historical and enviromental experiences lead to different levels of VOCABULARY RICHNESS between the various tongues, and thus different forms of perception between their speakers. One of the first problems that a native English speaker (or anyone from a historically non-rice growing culture) has when begining the study of the Japanese Language is remembering that there are several different words that the Japanese use when WE would just say RICE. Rice still growing in the fields is INE (稲, though in English we have adopted the Malay word PADDY for the same meaning), uncooked grains of rice are KOME (米), and cooked rice can be either GOHAN　（御飯) or MESHI　(飯). This, of course, simply reflects the importance of rice cultivation in Japan (and Malaysia etc). At the same time we can see how, in conversation, the Japanense do not usually distinguish between wheat and barley, which are both simply referred to as MUGI (MUGI). Another basic and interesting language learning problem for ALL students of Japanese is that while most other languages have words equivalent to WATER, and HOT WATER, the Japanese have completely separate terms for the two- MIZU (water) and OYU- (hot water). We CANNOT say that MIZU is hot. If it is hot , it is OYU-. I am not aware of any other language which uses this distinction and I believe that this must reflect the ABUNDANT HOT SPRINGS of the Japanese Archipelago which the Japanese have taken advantage of since time immemorial. When one delves a little deeper into the Japanese Language, and especially when one studies its traditional forms of poetry, one is struck by the UNUSUALLY MANY different terms which can be used to express different types of rain- with not only intensity, duration and temperature being indicated by each term, but often (and ALWAYS in the case of the HAIKU keywords) a specific time of year evoked. Just why this rich RAIN RELATED linguistic legacy evolved in Japan can be explained by a combination of factors. First, Japan IS a VERY RAINY country ( 1800 mm in annual precipitation, twice the world average). Unlike other countries in Asia which also have a monsoon season, Japan has no dry season, with rain falling throughout the year. In each season, precipitation is brought by different seasonal metereological phenomena which do in fact have different characteristics. This alone , however, might not explain why the Japanese language developed so many rain expressions. 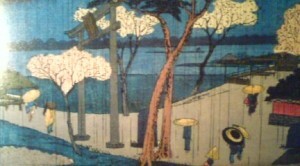 It was Chinese civilization,which carried with it so much prestige (especially among the Japanese nobilty of the 7th-1oth centuries), which got the Japanese (first the upper-classes and eventually the rest of the nation) to look closely at the flow of the seasons and express what they found in various art forms- especially poetry. The Japanese, as they have done regularly throughout history, took this concept from the Chinese, and applied it WITH A VENGEANCE. In fact, it might be possible to say that the combination of taking note of, appreciating and reacting to the annual, seasonal, monthly, weekly and daily changes in the natural world is the MOST important characteristic of TRADITIONAL Japanese culture. It was because the Japanese, and especially their great poets, took note of natural phenomena, that so many special expressions arose in an attempt to capture Japan`s many types of rain. It is not my intention here to offer a comprehensive list of all rain words which are currently used in converstion or in poetry. That would be the subject of a much longer work. I will, however, offer a sample of KIGO (season indicating key-words for HAIKU poetry) and also some expressions commonly used in daily life. Let me begin with spring and proceed through winter. TSUYU (梅雨) Literally plum rain, this is the term used for the rainy season. This term is used because it is in this season, late june and early July that Japanese plums are ripe and ready to be harvested. They are either salted (to make UME-BOSHI) or used to make liquor(UME-SHU) or juice. KUSURIFURU (薬降る) Literally- Its Raining Medicine. The fifth day of the fifth lunar month was Medicine Day. Rain that fell on that afternoon was believed to have curative powers. YU-DACHI （夕立) Literally Standing up in the evening, this is the common expression used for the frequent (and short lived) evening downpours of late summer. These are often accompanied by thunder and lightning. KIU (喜雨) Literally joyous rain. This is the rain which falls after a dry spell in late summer. The farmers are of course joyous when it falls. OYAMA ARAI (御山洗い) Literally mountain washing rain. This is the rain which falls at the end of August when the season for climbing Mt Fuji is officially closed. The rain cleanses the mountain of the climbing seasons impurities. SHIGURE (時雨) Literally time rain, this is the short rain of late autumn. It clear up before you know it. HISAME (氷雨) Literally ice rain. This is rain mixed with ice. KITSUNE NO YOMEIRI (狐の嫁入り) Literally a fox`s wedding,, this is an expression for a sun-shower. The Japanese traditionally believed that the fox is a trickster and rain while its sunny seems pretty tricky! Here is an expression that I like- HIJIAME (literally elbow rain). This is a shower which sets upon you so suddenly that theres no time for an umbrella. You have to raise you arm over yor head and protect your head with your sleeve! There is also NIWAKA AME (俄雨), a rain that starts abruptly, and ends just as suddenly. For heavy rain OH-AME ,DOSHABURI or GO- U can be used. These days ,however, Ive been hearing an interesting new expression used to describe the torretial rain storms many believe to be the result of global warming. It is GUERRILLA GO-U. Please remember that this is only the tip of the iceberg. I hope in the future to give you some more Japanese rain words AND some example of how they have been used in poetry. I didnt mean for this to be such a lengthy (and probably boring ) post. But what can you do- when it rains it pours! My Wild Garden Abloom With HARUJION (春紫苑), a Flower whose local nickname expresses my financial state! I like those old pictures. Never boring with your post, Avi, never with the score!!! Bravo to share with us these expressions! Though the Tsuyu (rainy season) was declared officially over by the Meteorological Agency of Japan rainy seasoncnditions have been continuing for more than 10 days! This might be one of those years in wich the agency has to officialy admit that they have made a mistake (as they have done in the past)! Anyway, the frequent rains cool weather and overcast skies have has brought an expression I had never heard before to the lips of many Tsukubans- MODORI TSUYU (which literally tranlsates as The Return Of The Rainy Season) to describe this state of affairs. 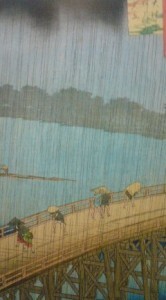 For me it also seemed natural to create this expression- ZAN-U （残雨）、which would directly translate as REMAINING RAINS. Also, if you have been watching the tv news you might hve seenthe torrentail and flood causing rains in Kyushu referred to as SHU-CHU- GO- U (集中豪雨), which literally means CONCENTRATED GREAT RAINS.